The good: It doesn’t sound “good,” per se, but a major context of Nic Dowd’s 2016-17 season was that he was unlucky. And not just unlucky, but historically unlucky. Considering the Kings aren’t exactly the sharpshooting Harlem Globetrotters when it comes to shooting luck, Dowd’s era-low PDO is an interesting and meaningful anomaly unearthed from the most recent 82 games. His .946 PDO – the fifth lowest in the NHL among players who played more than 500 5×5 minutes – was the lowest PDO among similarly qualified Kings since 2007-08. PDO isn’t close to being an airtight harbinger for luck (What is PDO? ), but placed in context with other statistics, it does provide some depth and dimension and suggests where regression or progression may take place. And it did corroborate several other metrics indicating Dowd was probably playing on the right side of the puck and generating his share of chances (which simply weren’t going in). He led L.A. forwards and ranked third among NHL forwards – behind Patrice Bergeron and Brad Marchand – with a 57.6% raw Corsi-for percentage. 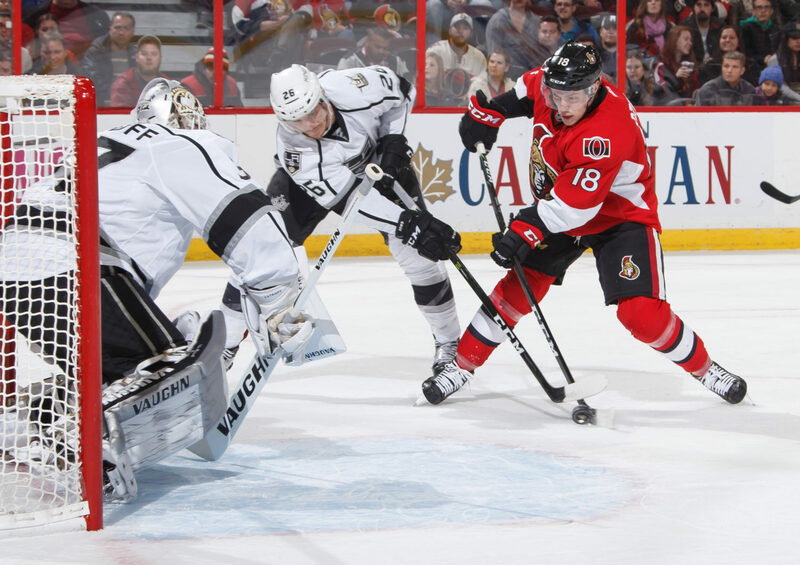 The Kings accounted for 54.1% of scoring chances and 56.8% of high-danger scoring chances while he was on the ice, according to NaturalStatTrick.com, and yet the Kings were credited with eight goals for and 16 against in high-danger situations that included Dowd, who ended the year with a minus-15 rating. This doesn’t quite add up, and really, Dowd more or less represents a case study in Los Angeles operating with a possession advantage that it just wasn’t able to turn into cold, hard scoring with any great consistency. Dowd was also unlucky in a broader sense in that he was a first-year player in the final year of Darryl Sutter’s tenure. Sutter’s methods led to two Stanley Cups, but they also led to a harsh and demanding introduction into the NHL for some of the team’s youngest and least tenured players. Dowd, who turned 27 in May, isn’t particularly young, but it did seem that he, like many others, had to answer to a tough coach in a season that never really accelerated toward a second gear nor one in which the two-way center was able to parlay his own defensive acumen into keeping the puck out of his own net. Dowd is a playmaking center. He can score, and the former Hobey Baker finalist is also a former NCHC Defensive Player of the Year, but his identity and strength lies in his ability to hold onto pucks for an extra beat before making plays. This allowed him to be a highly effective weapon on a second power play unit that for stretches of the season outpaced the top unit. Dowd’s on-ice 7.69 G/60 during all power play situations ranked third among Los Angeles forwards, as did his 14.89 on-ice shooting percentage. This is a good representation of his playmaking ability. 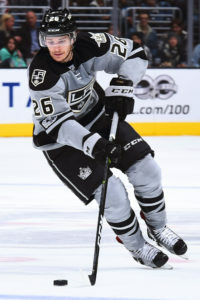 “Dowder, he’s shown that he can be a pretty good power play guy for us in terms of making the play or hanging onto the puck and making a good decision with it,” Sutter said in January before referencing criteria – such as playing away from the puck and playing in his own zone – any young center will have to improve on. The bad: “I think that Nick Shore and Nic Dowd are pretty well balanced right now just based on minutes played. That’s how we’ve used ‘em,” Sutter said in January. “They’ve both missed games as coach’s decisions, so I think there’s still very much finding out where they fit in. I’ve said it lots. When you have Kopi and Jeff as your top two guys, then you need guys to take more responsibility and take good minutes and accomplish something while they’re getting those minutes. We don’t have a three or a four right now. We have guys that are balanced in.” And that’s the way it remained for much of the season, as neither Dowd nor Shore took any sort of stranglehold on the third line center role. Shore actually outscored Dowd in goals, assists and points in five-on-five play, averaged more time on ice per game and served as a complementary penalty killing option to Dowd’s power play prowess. Both were useful in situations, though neither excelled. Dowd’s 47.8% faceoff rate (and 47.3% even strength faceoff rate) was the lowest among any King who took more than 100 draws. Dowd wasn’t a high-volume shooter, and his 4.7 shots per 60 minutes placed him between Jordan Nolan and Kevin Gravel. One of Sutter’s observations was that Dowd wasn’t particularly good on the second night of back-to-backs, when he totaled one assist, a minus-one rating and a 43.9% faceoff rate in 12 games. In early April, Sutter said there were still ample steps for Dowd to take. “Offense, defense, training, preparation, match-ups, road play, back-to-back situations, go on and on,” he said. Dowd, who had four goals, eight points and a minus-11 rating in 34 road games, experienced growing pains in keeping the puck out of his own net and minimizing scoring chances against. While the goals against presented challenges, there simply wasn’t enough production to justify an increase in minutes. It’s related to the lousy luck described above, but the Kings averaged 1.21 goals for every 60 minutes Dowd was on the ice. There were only two forwards with whom Dowd played alongside during which Los Angeles yielded a positive GF-GA/60 differential: Marian Gaborik (who logged only 78 5×5 minutes alongside Dowd), and Jonny Brodzinski (18 minutes). Though he’s long been a responsible center in his NCAA and AHL days, he didn’t crack the team’s penalty killing rotation, and no other team forward started a lower percentage of 5×5 shifts in the defensive zone or a higher percentage of shifts in the offensive zone. 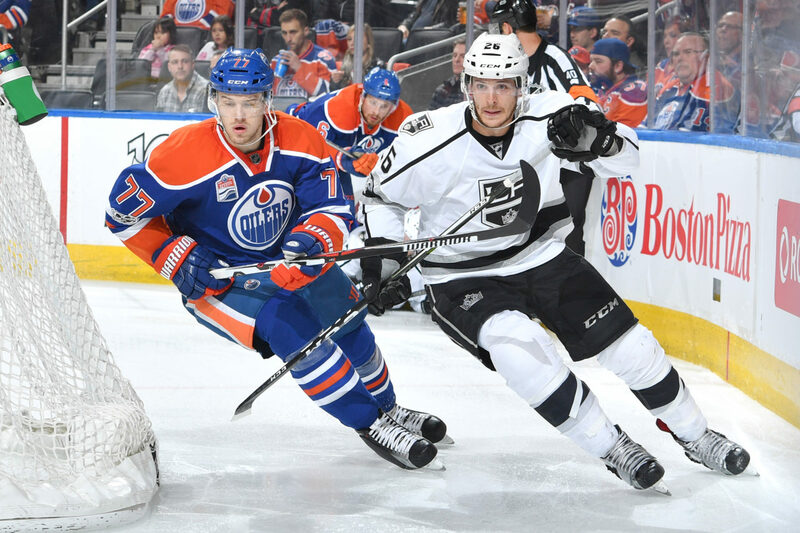 Going forward: There were those in the organization concerned that the Kings could lose him in the expansion draft, but with the Golden Knights’ claim of Brayden McNabb, Dowd will return to the Kings with one year remaining in his contract at a minimal $640K cap hit. 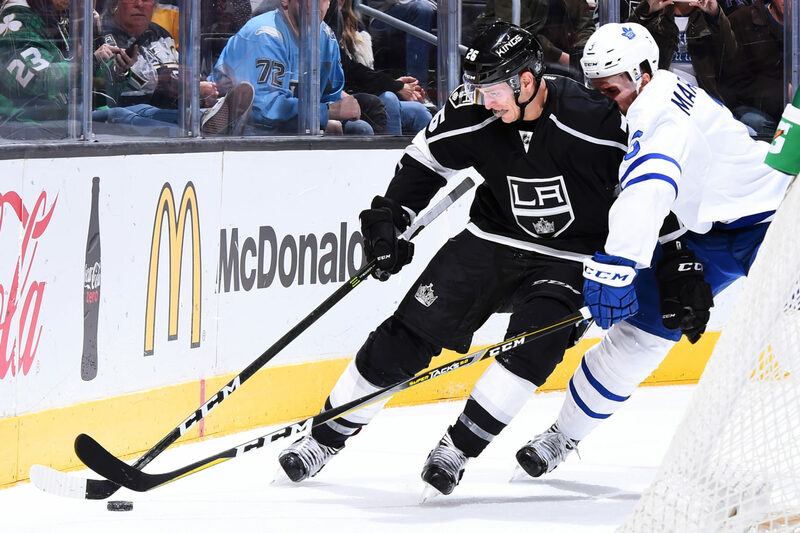 The depth center slots are again open, but there’s no shortage of competition as Shore, Trevor Lewis, Andrei Loktionov, Andy Andreoff, Adrian Kempe, and, later down the line, Michael Amadio will compete for such roles. Though he’s 27 years old, there is clear and tangible if somewhat limited offensive upside that Dowd can reach with some better bounces and an accentuated refreshment of his 200-foot game, assuming he continues to produce on the power play, where his nine points ranked third among team forwards. Like many Kings, he’ll be an interesting player to study in the evolution of the team’s systems as the reins change hands from Sutter to John Stevens. 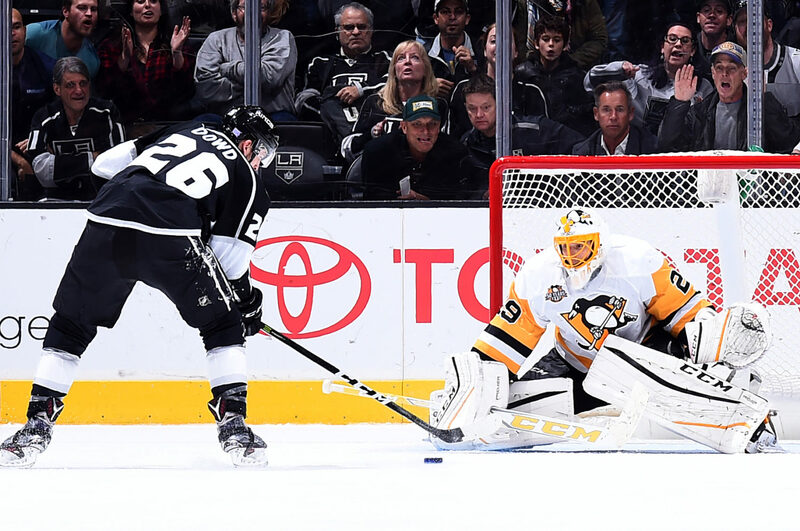 Los Angeles’ .908 save percentage with Dowd on the ice should be expected to improve, and in taking a step forward in cutting down on the goals and chances against, he’ll earn a longer leash towards assuming additional responsibility as a third line center. With additional emphasis on zone entries, playmaking and finding players capable of dishing the puck from the perimeter to the center of the ice instead of constant waves of shot volume, Dowd could be a player primed for a modest increase in scoring in his second full NHL season. “You start off with a new team and different needs and then you try to find where you fit in,” Dowd said in December. “You’re trying to make plays adjusted to the speed, obviously bigger players, better players, and then you get here and the exact same thing occurs. It’s been peaks and valleys, I think there’s been some really, really good points in the last 25 games, and then I think there’s been some really low points. But I think just trying to find that consistency will allow my game to get better and better.” One year after entering a competitive preseason camp with the desire to be “responsible,” a similar approach should apply. There are some interesting, offense-driving attributes in Dowd’s game that shouldn’t come at the expense of his 200-foot play, and in 2017-18 he’ll look to straighten out some jags in his own end of the ice while showing he’s more than simply an option for a third line center role, but rather someone who can produce as a center while growing into a wider array of situations. How would you grade Dowd?